Concern: Will Chicago’s new inclusionary zoning law allow double-counting? Warning: this post gets a bit into the legislative weeds. So as I wrote at Next City, Mayor Emanuel’s affordable housing commission just announced their recommended amendments to the city’s inclusionary zoning law, or ARO. (Affordable Requirements Ordinance.) Mostly, this involves closing or tightening loopholes that allowed developers to push new subsidized units out of wealthy neighborhoods, and into poor ones. On page 9 of the ARO proposal. Click for a link to the document. To summarize: the Chicago Housing Authority (or other “authorized agencies”) can buy ARO-produced units and run them as their own. In fact, not only can they do that, but the city is giving developers a financial incentive to sell. If someone builds a 40-unit building on the North Side, the new ARO says they’re responsible for four subsidized units, or an equivalent fee; one of those units has to be on site. If the developer chooses to pay the fee for the remaining three, that’s $375,000 (at $125k per unit). But if the developer sells the one unit they built to the CHA, they save $25,000 in fees per remaining unit – meaning $75,000 in all. Anyway, at first blush, I don’t see any reason why converting ARO units to CHA units is a problem. Except for this: Rahm Emanuel has announced that he wants the ARO to create 1,200 units of affordable housing over five years. The CHA, separately, has a longstanding commitment to maintain 25,000 units of housing, of which it is short about 7,000. In other words, it appears that we currently have a commitment from the City of Chicago and its partner agencies for 1,200 + 7,000 = 8,200 new units of affordable housing over the near term. The issue is what happens with units that are produced by the ARO, and then bought by the CHA. Presumably, Emanuel – or whoever is mayor at the time – will want to tout those as “ARO units,” since they would have existed without the law. Presumably, the CHA will also count them as “CHA units,” because, you know, they’ll be CHA units. But what that means is that we’ll be double-counting. And in the extreme (though possible!) 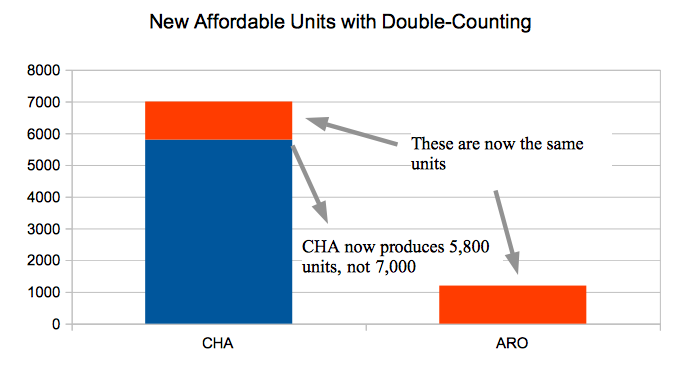 scenario that the CHA buys all 1,200 ARO units, instead of 8,200 new subsidized housing units, the city will get only 7,000 – because every unit the CHA buys from the ARO is a unit they don’t have to produce separately themselves. Anyway: the stated purpose of the ARO amendment is to improve upon the old ARO, which only produced 189 affordable units over 7 years, or something like that. But double-counting, by creating the possibility that every new ARO unit will simply displace a CHA unit that would have been created, also makes it possible for the new ARO to have zero net impact on the total number of affordable units in the city. That is, if you look at the graph above, double-counting every ARO unit would leave the city with 7,000 new units – the same number the CHA would be obligated to provide if the ARO didn’t exist at all. Now, caveats: I’ve asked around about this, and haven’t yet heard any reason that would prevent the CHA from buying up all the ARO units, but it’s possible that such a reason exists, and I’m just not yet aware of it. If you know of that reason, tell me! It’s also possible that, even though the CHA has promised 7,000 new units, the CHA’s pants are on fire, and there’s no way they’re actually going to deliver that any time soon. 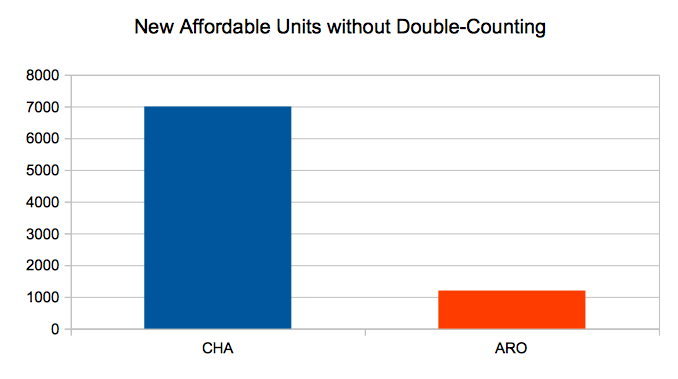 In which case the ARO isn’t displacing CHA units, because the CHA can’t/won’t produce new units on its own. Maybe. That seems like a pretty unsatisfying answer, though: if you’re the City Council (or, say, the mayor), why not just find a way to force the CHA to live up to its promises? Am I getting this wrong somehow? Or does there need to be some safeguard in the new ARO? I think the way to read this is that the City or CHA WANTS to control/own/operate new ARO units, rather than have the developer keep them or sell them to some third party landlord. I don’t know how the Affordable Requirements Ordinance is written, but perhaps it doesn’t have enough guidance on how ARO units are managed (who gets to rent them)? Just because you require a rent cap on a property doesn’t necessarily mean you’re going to rent it to a poor person. But having the CHA purchase the property (in theory) ensures that those benefits are going to a deserving person in need.